My broadcast professor at Medill introduced himself as the voice inside Tom Brokaw’s head. He explained that communicating with his anchor during a live show was critical when he was an executive producer at NBC News. He showed me what it takes to make it in broadcast news. Now I’m following in his footsteps. In the booth, I saw some breaking news on the sentencing of Bernie Madoff. Before we moved on to the next story, I told my anchors what was going on in NYC through their IFBs. 30 seconds later, my anchors updated the story on live TV. 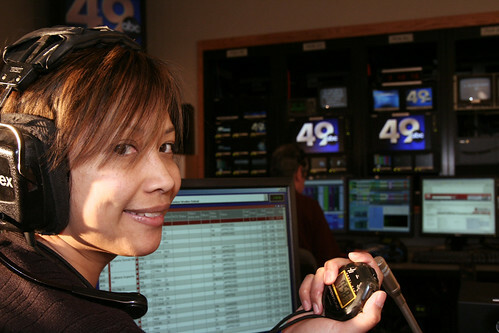 As a news producer, I take care of the stories, video, live reports and the focus of the news show. Most importantly, I’m telling other people’s stories. Breaking news, community events to the world’s ugliest dog – I get to write about what’s going on in our viewing area and the rest of the world. I know this can translate into A Really Goode Job. One of my news anchors sums it up nicely in this video reference. Matt Brennan is living in LA now. Beyond the Newsroom from Kris Vera-Phillips on Vimeo.